We all know the story of the frog turning into a prince, right? Well this little fella didn't even need to be kissed! Scientists in Ecuador have discovered a previously unknown species of frog and have named it after Prince Charles, the Prince of Wales. 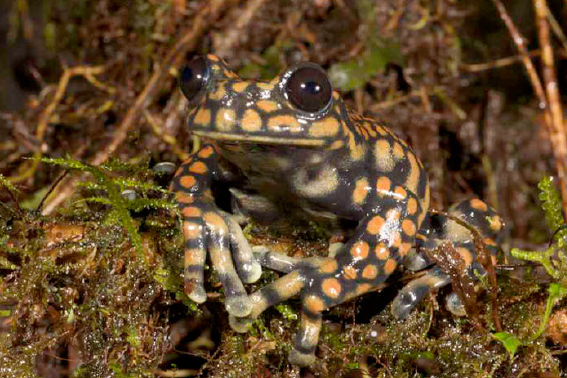 The colourful stream frog, with the official title Hyloscirtus princecharlesi, was one of two 'new' species (along with Hyloscirtus cryptico) discovered in the highly endangered clouds forests in Ecuador four years ago. The naming honour was in recognition of the royal's work in the preservation of such tropical forests, including his efforts to mobilize political and financial support for a program to compensate developing countries for conserving their rainforests. Charles met Coloma earlier today at a workshop in Britain. The princely frog is certainly in danger though. It's habitat, montane forest streams, is particularly affected by the chytrid epidemic that has killed untold numbers of amphibians globally and driven dozens of species to extinction since the early 1980s. Full details of the discovery is available with open access in the journal Zootaxa.